I chatted with a few of my brides and they thought that a little breakdown of a wedding day in a blog post would be a great idea, so here you go! Let me start this post with this... this is all my opinion, as a photographer who has shot hundreds of weddings, I think I have a good handle on the way any wedding day will go. However, this is just my opinion, and one that I have gathered over the years on how a typical wedding day will unfold in the most efficient way, but there are exceptions to the rules. Also, this post has nothing to do with Wedding Planners, they can be an absolute godsend on your day and really know their stuff but some brides go at it alone...and this is for you. That is a pretty basic list of the general outline of the day, but keep in mind, there are many things that can happen in between each of those. 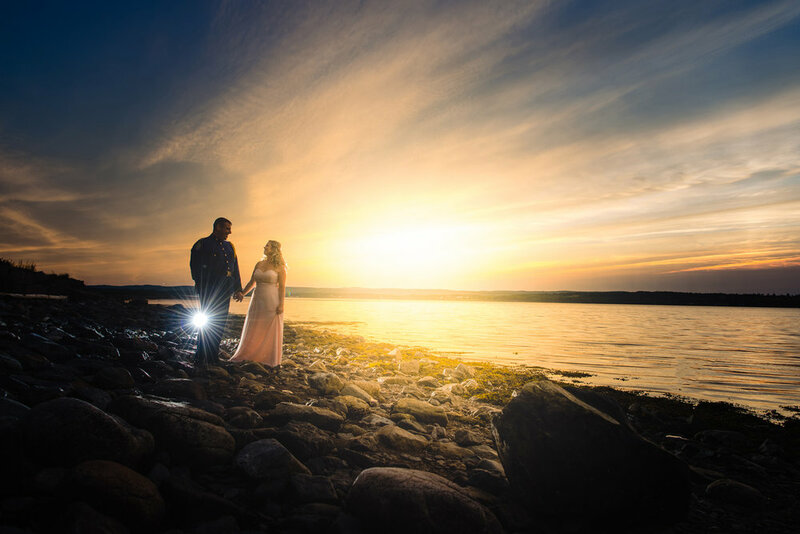 For example, night time or sunset photos between the supper and reception, a "first look" session before the ceremony, more little photo sessions, cruising in your sailboat, a motorcycle ride, etc. You get the idea. This is typically where most photographers start their day, I personally start at make-up if my client wanted full day coverage. In my opinion the best photos from preps are during make up, typically at this point the bride and bridesmaids have their hair done and are ready for some photos. Anything before that usually ends up being a lot of sitting around waiting for make-up shots and ladies not wanting their photos taken yet! Sometimes, these appointments are booked very early and its not possible for us to get there or it extends the day by 3 or more hours, but don't worry. You can "fake" it. 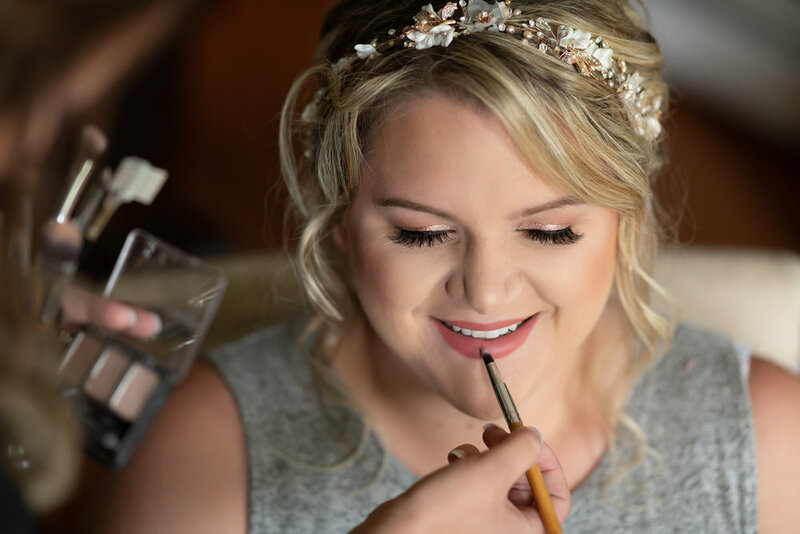 Most times after the bride arrives back home or back to the hotel/resort where they are getting ready, there are lots of touch ups to hair and make-up and it is a perfect time to get those good detail shots. Some of the best shots happen during this time, we can take more time to get some great photos and not get in the way of the artists or slow them down. Also, the ladies are all done up and the fun is about to begin! This shot below was totally "faked"...however, it was not a fake part of the day, we had a good laugh pretending to do some make-up and ended up with a great shot. This is a great time to get some shots with the Groom and his boys as well. I try my best to cover both the bride and groom with their preps, when possible. The guys are more about getting ready and hanging out, having a beer or just taking it easy. Guys take way less time to prepare than the girls, so there is not much point in having them get ready at the same time as the ladies. You've put some time and thought into picking out the perfect dress and the time has come to get that bad boy on. Before that happens, photographers have most likely taken some shots of all of your details, the dress, shoes, jewelry and anything else that has meaning to you. I usually arrive a little earlier for this very reason! For the dress shots, I like to have the bride jump into her dress, cover up her parts and then join in on finishing it off. Whether you have a tie up or a zip up, there's lots to capture. This can be the bride all alone, just her and her mom or the bride and all the girls, whatever you want and whatever is happening. There are some special moments to be captured in any set up that you have. Quiet and calm or total pandemonium! It all makes for great images. This should be a very relaxed and fun part of the day. For me, this is one of my absolute favourite parts of the day. This is the time right after you are totally done and ready and about to go get married, your last single life portraits. I like to take the bride somewhere close, all alone and get some beautiful portraits of just her. There is something about the shots of the bride at this point in the day that I believe will have so much meaning later on in life. Imagine showing your grandchildren these photos in 50 years and having them gush on just how beautiful you were on the day you started your family journey. I only take about 5-10 minutes for this, typically I like to find a nice shady spot outside and just get some great stuff with nice soft lighting. But, as you can see below, these particular shots were taken just across the street from the hotel that the bride was getting ready in, we use what we can and this ended up being great. The light was fantastic and we didn't have to go very far. Rachel was stunning on her day, it wouldn't matter where we did portraits of her. Big thanks to Alex MacAulay for this "action" shot! The big part of the day, the part everyone was waiting for. In the last few years, the backyard or outside wedding has nearly taken over the church wedding. I'm not sure why the switch, but there is a big difference today compared to 5-10 years ago. I personally only have one church wedding in 2018. Every other ceremony is either in a backyard, at a resort or on a roof top of a farmers market. Maybe a sign of the times, I'm not sure. I really do love a backyard or outdoors wedding, it doesn't matter to me where you get married though, they are all part of a special day. Following the ceremony is when I always recommend that couples have their family photos taken, if possible. For this, I always suggest to limit this session to Moms, Dads, Brothers, Sisters and Grandparents. I am super fast with family photos, I typically get laughed at when setting up and breaking down groups but I have a plan and a method which limits the amount of time people are standing around smiling for photos. No one wants to stand in a line up for an hour in the middle of August, so getting it done clean and fast is the plan! I have been thanked many times for being fast and efficient with group stuff, so I will take that as a sign that we are doing this part of the day right! We also get bridal party groupings here as well, but just the formal ones, the fun ones usually come later. Family photos are a big deal to me, they are a must. Honestly, if anything on a wedding day stressed me out, it would be family photos. Once they are complete, it is game on! This is the time that I typically head out with the bride and groom and sometimes the full wedding party for the fun stuff. Some clients are interested in having their bridal party with them the entire time and that is fine, but some also want to go out on their own alone for this part, either way works but if you have a large bridal party, that could slow things down. Depending on how you have your day planned and if you didn't do a "first look" together, this is the time to fit in a block of time to get some stuff done. I always like to have at least an hour here, but I will take whatever I can get! 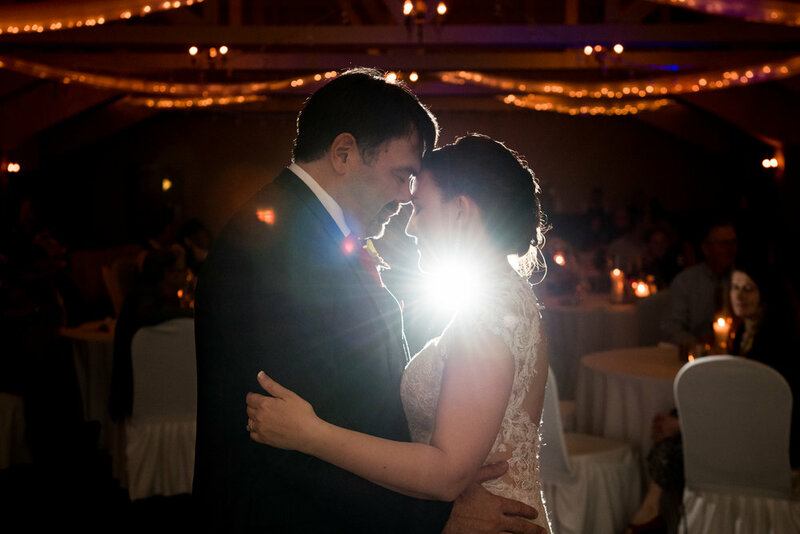 The "first look" option can almost eliminate this, having it all done before the ceremony really makes the rest of your day that much more relaxed. This is where we visit some locations near by to get some creative stuff, this is always best later in the day as the light is typically better and softer. Even though this may be earlier in the day, I always try my best to get out during sunset for some really amazing light. A goal of mine is to capture the beauty of the landscape in my clients photos, if possible. In Cape Breton we are surrounded by it and we are proud of it, so why not show it off! This time is all about the bride and groom, it's their time. For that reason, I try my best to get as much variety as possible but also to leave some time afterward for you to chill out and hang with the bridal party or family. Enjoy the day a little more and be present with your people, unless you want to ride the train right up until the last minute, then I'm down with that as well. Just blame me when we are late for the supper! Almost done! Time to eat and maybe have some speeches. For me, I like to be seated somewhere close to where you have the mic. This helps me stay out of the way of the guests and not distract anyone, keeping the focus on the MC or whoever is speaking. I am not the focus of your wedding day and do not want to be. I once had a mother of a bride call me the next day and ask if I was even at the ceremony! I had a great laugh with that one, of course I was there! I was just out of the way so much as to not take any attention away from the bride and groom. 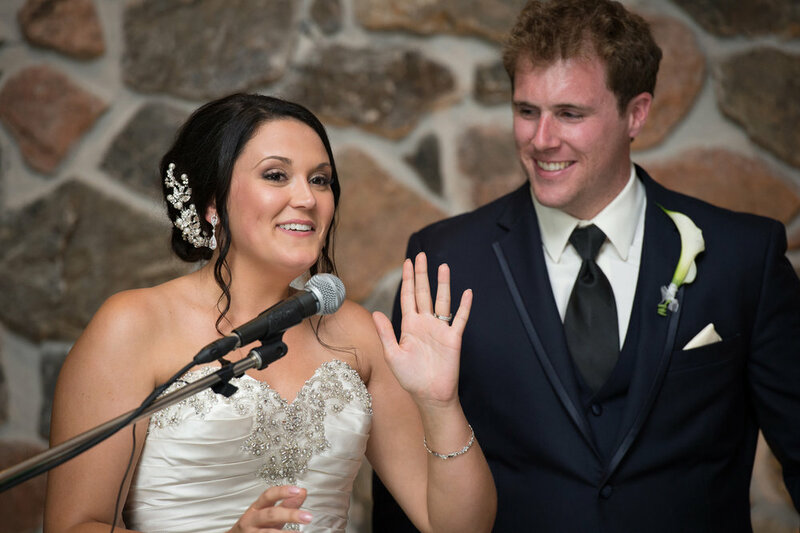 The supper and speeches are a great time to get those real reaction moments, there is nothing better than when a father of a bride is grinding the groom and making fun of him. The laughs and reactions are priceless! I love the stories, this is when it all comes out. Leave it up to the best man to bring up some silly stories from the past and let the laughing tears flow! Time to party, but first...let's do your first dances while all of your guests are there. They want to see the dances, the grandmothers can't stay there all night, so let's get it done! Bride and Groom, Groom and Mother and Father and Bride are the main dances at this point, sometimes there are other combos, sometimes the full bridal party dances, sometimes it's just the bride and groom, whatever works. It's dance time. This typically ends the day for me. I try to get some shots of the following fast tunes before the full on party starts, or head out for a night time shot if we are in a good location, but that is check out time for me. I need to head out, back up cards, ensure all of your images are saved into three different places. I have one HUGE main hard drive that everything gets saved to first, a small external drive that is always with my laptop and that I edit from, and an online cloud storage back up system. This all gets done before my head hits the pillow. This is important, your images are important and need to be well taken care of to ensure nothing happens! In conclusion, this is typically the way most days flow. Like I said before, things can change, but for the most part and even though most weddings these days are much different than 14 years ago, the main parts of the day are usually the same. You need to get ready, you need to get married, eat and have a party! 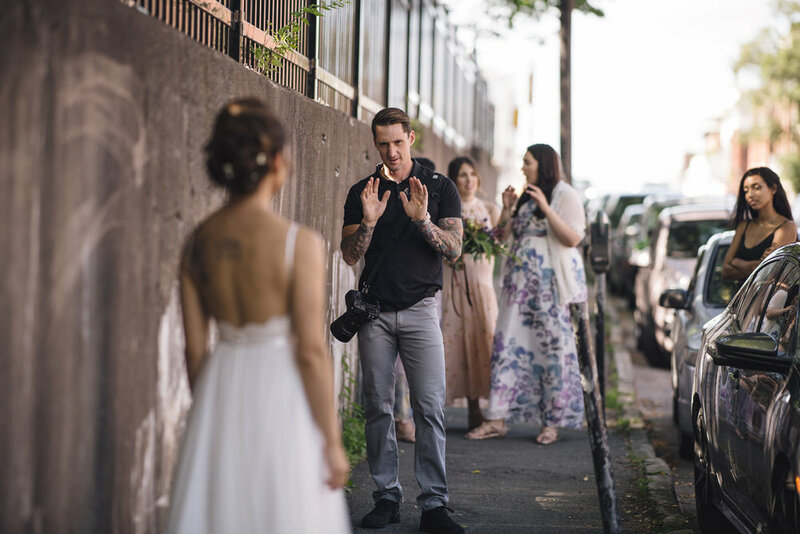 I really hope this blog post helped a bit with understanding the day, or even understanding how I personally work as a wedding photographer. Email me with any questions you have about this, or if you need a suggestion. Even better, if you are having a unique and different wedding, let's have a chat! I love weddings!